Fong returned to Honolulu each summer to work for Wright to afford tuition. After obtaining his law degree in 1935, he returned to Honolulu permanently, passing the bar and accepting the Honolulu attorney general’s office position that Mayor Wright had promised. But the work and pay underwhelmed Fong, “I felt, gee whiz, with all my education, is this all I am going to wind up doing?”10 In 1938 Fong married teacher and longtime sweetheart Ellyn Lo, with whom he eventually had four children, Hiram Jr., Rodney, Merie-Ellen, and Marvin Allan. A month after the marriage, Fong’s mentor George Wright passed away. After three years of struggling to maintain interest in his work, Fong planned to leave his city job and start his own private practice. Hoping to gain public attention to kick-start his practice, Fong turned to his passion: politics. “So I thought, well I’d better get out … and since I [was] going to get out, I’d better run for office,” he recalled.11 Fong entered the race for one of six territorial house seats in a district encompassing much of the island of Oahu north of Honolulu. He easily won the 1938 Republican primary campaigning on a theme of “local boy makes good” and was swept into office with a surprisingly high vote total for a political newcomer, the second most votes in the district.12 He resigned from the attorney general’s office and opened his own practice. Drawing on his popularity, Fong asserted his political independence both within the Republican Party and from the “Big Five,” the five largest sugar companies with stakes in Hawaiian production. This rankled the establishment and led to a failed attempt to declare his election illegal on the basis that he was employed by the territorial government. Over Republican speaker Roy A. Vitousek’s opposition, the legislature seated him by a vote of 27 to 2.13 The incident only increased his fame and gained him support from organized labor, bolstering both his political position and his law practice. He easily won re-election in 1940. “The people have thrown me out. I’m a private citizen now, so I’m taking things easy,” Fong said, doing anything but. “I’ve been retired and I’ll stay retired. I don’t want people to think I’m a bad loser.”18 To that end, Fong recused himself from politics for five years and turned his attention to his business ventures. He set up the financial services firm Finance Factors Ltd., in 1954 in Wailuku, Maui, to operate alongside his Honolulu legal practice. He diversified his business interests, setting up Finance Realty, Finance Investment, and Finance Home Builders Ltd.19 In the summer of 1959, however, the prospect of imminent statehood drew him out of self- imposed retirement. Instead, the Republican Party establishment embraced both Fong and his independent streak. Vice President Richard Nixon met Fong and his family at the airport, launching a long friendship that would last through Nixon’s presidency. Senate Republicans held a party in Fong’s honor after the new Hawaiian delegation was sworn in on August 24, 1959.22 At that ceremony, Fong won a coin toss for the role of senior Senator over Oren Long. The pair then drew lots to determine the length of each Senator’s term; Fong secured the longer term, putting off a re-election campaign until 1964.23 He earned seats on three committees: Post Office and Civil Service; Public Works; and Interior and Insular Affairs. He joined the Judiciary Committee in the 87th Congress (1961–1963) and the Appropriations Committee in the 91st Congress (1969–1971). He also served on the permanent Select Committee on Aging after the 88th Congress (1963–1965) and retired as that panel’s Ranking Member. Fong requested and was granted placement on the Appropriations Subcommittee on Labor, Health, Education, Welfare and Related Agencies, seeking to check the power of the very unions that had helped launch his Senate career. “I believe labor legislation is essential for our nation as well as for democracy in both unions and business,” he said. “Both will have to conform to the laws of the land.”24 His voting record offered a muddier picture. Fong typically took the business side of consumer and labor issues, drawing heavily on his financial background, but liberal Senators counted on Fong’s labor connections for his vote on key issues. 1“Senator Hiram L. Fong of Hawaii,” 17 July 1964, Christian Science Monitor: 13. 2Caspar Nannes, “Senator Fong of Hawaii,” December 1973, The Link: 21. 3David Ignatius, “Hiram L. Fong, Republican Senator from Hawaii,” in Ralph Nader Congress Project: Citizens Look at Congress (Washington, DC: Grossman Publishers, 1972): 1. 4Michaelyn Pi-Hsia Chou, “The Education of a Senator: Hiram L. Fong from 1906 to 1954” (PhD diss., University of Hawaii, 1980): 59–65. 5Helen Zia and Susan B. Gall, eds., “Hiram Fong,” in Asian American Biography (New York: UXL, 2003): 74–76. 6Chou, “The Education of a Senator”: 143–149. 8Ibid., 242–246; Don T. Nakanishi and Ellen D. Wu, Distinguished Asian American Political and Governmental Leaders (Westport, CT: Greenwood Press, 2002): 47–48. 10Chou, “The Education of a Senator”: 290. 15Much of Fong’s enmity with party elites could be traced back to his rivalry with Roy Vitousek, who led the Hawaii Republican Club after he left as the speaker of the territorial assembly. Fong undermined Vitousek by elevating Manuel Paschoal—a fellow critic of the old guard—in 1945, using key Democratic votes to do so. When the legislature split evenly in 1947, Democrats offered Fong as a compromise speaker alongside Fong’s 1945 Democratic collaborator Charlie Kauhane as vice-speaker. Fong publicly repudiated the resolution, prompting a fistfight in the legislature’s lobby as Kauhane accused Fong of manipulating Democrats into a resolution he knew would fail. Fong denied the allegations and used the press gained from the incident to pressure Democrats into electing Paschoal again. For additional detail, see Chou, “The Education of a Senator”: 444–445, 474–478. 17John S. Whitehead, Completing the Union: Alaska, Hawai‘i, and the Battle for Statehood (Albuquerque: University of New Mexico Press, 2004): 194; Chou, “The Education of a Senator”: 708–711. 18Gardiner B. Jones, “Fong Thanks Democrats for Fouling Up Sessions,” 21 May 1955, Honolulu Advertiser: A6. 19“Senator Hiram Fong 80th Birthday,” 1986, pamphlet in files of the U.S. Senate Historical Office, Washington, DC. 20Whitehead, Completing the Union: 317–321; Adam Bernstein, “Hiram Fong Dies; One of First Hawaiian Senators,” 19 August 2004, Washington Post: B6; “Republican Wins Hawaii Governorship,” 30 July 1959, Chicago Daily Tribune: 5. 21Ray Maneki, “Fong Tells Rags to Riches Story,” 4 June 1976, Honolulu Star-Bulletin, reprinted in Tributes to The Honorable Hiram L. Fong of Hawaii in the United States Senate, 94th Cong., 2nd sess., S. Doc. 272 (1977): 21–23. 22Dillon Graham, “Fong Arrives, Welcomed by Nixon,” 24 August 1959, Washington Post: A8; Eileen Summers, “Senator’s Hello, Hawaiian Style,” 25 August 1959, Washington Post: B3. 23Congressional Record, Senate, 86th Cong., 1st sess. (24 August, 1959): 16739–16740; “Congress Seats Hawaii Members,” 25 August 1959, Washington Post: A10. 24“New Hawaii Senator Favors Union Curbs,” 23 August 1959, Los Angeles Times: A1. 25Chou, “The Education of a Senator”: 733. 26Ignatius, “Hiram L. Fong”: 6. 27Hiram Fong, “Mr. Nixon in Hawaii,” 12 August 1960, New York Times: 18. 28“Hawaiian Senator Here; Praises Aid for Asians,” 5 January 1960, Los Angeles Times: 5. 29Hiram Fong, “Time Is On Our Side,” 5 September 1961, Christian Science Monitor: 16. 30“U.S. Prestige High in Orient, Fong Reports,” 8 October 1960, Chicago Daily Tribune: A7. 32Congressional Record, Senate, 94th Cong., 2nd sess. (4 March 1976): 5438. 33Ignatius, “Hiram L. Fong”: 19–21. 34Peter J. Kumpa, “An Angry Debate Is on Party Lines,” 20 April 1972, Baltimore Sun: A1. 35“Fong Urges Passage of Immigration Bill,” 21 September 1965, Los Angeles Times: 5. 36Mae M. Ngai notably discusses how this influx of Asian immigrants, many of Chinese descent if not immediate origin, led to the rise of a new “model minority” stereotype that shares many similarities with Fong’s vision of what the average hardworking Asian immigrant— particularly those converted to Christianity—might have to offer the United States. For more on this, see Mae M. Ngai, Impossible Subjects: Illegal Aliens and the Making of Modern America (Princeton, NJ: Princeton University Press, 2004): 266–268. 37Ignatius, “Hiram L. Fong”: 22; Lynda Arakawa, “First Asian in U.S. Senate Broke Barriers,” 19 August 2004, Honolulu Advertiser: H1. 38“Immigrant Chinese Told to Integrate,” 16 November 1959, New York Times: 11. 39The East-West Center was established in 1960 under the Mutual Security Act of 1960 to “promote better relations and understanding between the United States and the nations of Asia and the Pacific.” Mutual Security Act of 1960, Public Law 86-472, 73 Stat. 134 (1960); Congressional Record, Senate, 87th Cong., 1st sess. (28 March 1961): 4977. 40Ignatius, “Hiram L. Fong”: 20. 41“Hiram L. Fong: Legislative Record,” campaign literature in the files of the U.S. Senate Historical Office, Washington, DC; “Fong Will Be Nominated as Hawaii’s Favorite Son,” 14 July 1964, New York Times: 21. 42Ignatius, “Hiram L. Fong”: 9; “Senator Hiram L. Fong: Biographical Sketch,” accessed 18 May 2016, http://www. senatorfong.com/bio_sketch.html; Almanac of American Politics, 1976 (New York: E.P. Dutton & Co., 1975): 206–209; Dale Andrews, “Paradise Found,” 23 May 2002, Roll Call: 38. 43Almanac of American Politics, 1976: 209; Ignatius, “Hiram L. Fong”: 9. 44Though vocally steadfast in his support, Fong eventually suspended Carson from his duties. Carson faced 18 months in prison following an unsuccessful plea for stay of sentencing. For more on the Carson affair, see Ignatius, “Hiram L. Fong”: 15; Ken W. Clawson, “Aide to Fong Is Indicted on Bribe Charge,” 14 January 1971, Washington Post: A1; John Hall, “Sen. Fong’s Indicted Assistant Back at Desk,” 10 February 1971, Los Angeles Times: B5; “Convicted Aide,” 10 November 1972, Washington Post: A2. 45“Sen. Fong to Retire,” 15 January 1976, Washington Post: A3. 48Dan Nakaso, “Hundreds Pay Respects to Fong at Capitol Rites,” 27 August 2004, Honolulu Advertiser: A1. Oral History: February 22, 1978-October 12, 1979. 306 pages. 7 interviews conducted by Michaelyn Chou. Index. Oral History: 1971. 5 pages. Limited to reminiscences of Russell. Papers: 1910-1990's (bulk 1959-1977). Ca. 559 cubic feet. Primarily correspondence and papers from his Senate service including legislative materials, committee related materials, grants and projects, casework, party political materials, office administrative papers, public relations files, personal and family papers, memorabilia, and audiovisual materials. Topics of interest include Hawaii statehood, Native Hawaiian land claims, the military presence in Hawaii, shipping issues, Judiciary committee issues, civil service issues, immigration, and campaigns. Finding aid available on-line. Chou, Michaelyn Pi-Hsia. "The Education of a Senator: Hiram L. Fong from 1906 to 1954." Ph.D. dissertation, University of Hawaii, 1980. 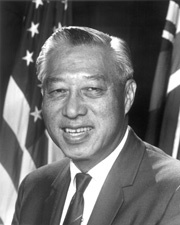 "Hiram L. Fong" in Asian and Pacific Islander Americans in Congress, 1900-2017. Prepared under the direction of the Committee on House Administration by the Office of the Historian and the Office of the Clerk, U.S. House of Representatives. Washington: Government Publishing Office, 2018. U.S. Congress. Senate. Tributes to the Honorable Hiram L. Fong of Hawaii in the United States Senate Upon the Occasion of His Retirement from the Senate. 94th Cong., 2d sess., 1976. Washington, Government Printing Office, 1977.